The day after the miserable ascent of Midnight Peak, my mom and I decided to do something less demanding, so our original plan was to do either Mt. 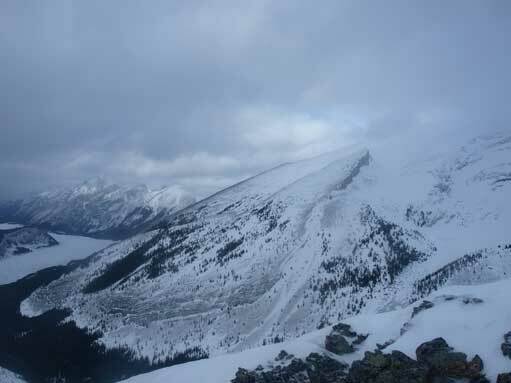 Yamuska or Mt. Baldy. However, due to the howling chinook, the wind speed on Mt. 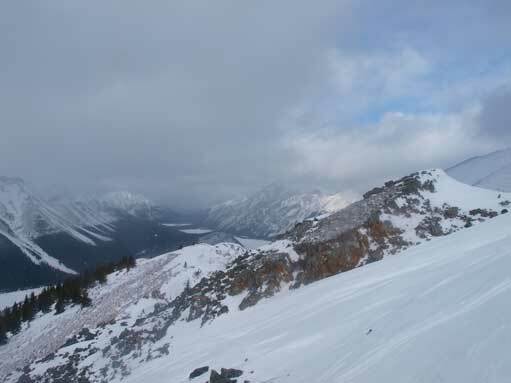 Baldy’s summit was forecasted to be approaching 150 kph. That’s not gonna work… Our only choice now was to drive up the rough Smith Dorrien Road. 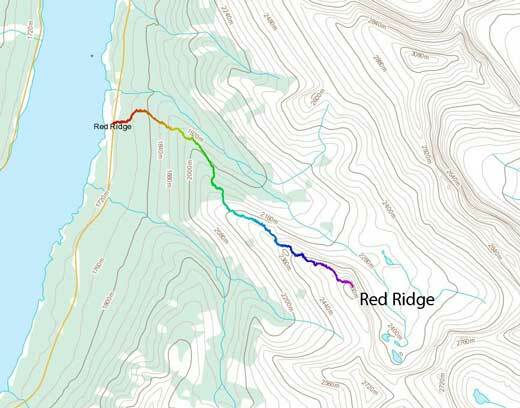 We chose Red Ridge, a “moderate to difficult” snowshoe objective. This a mere bump nearby the much-bigger Mt. Bogart and Mt. Sparrowhawk, and the stats didn’t look demanding (9 km distance with 950 m elevation gain), but really? NOOOO!! We had to break trail right from the beginning. 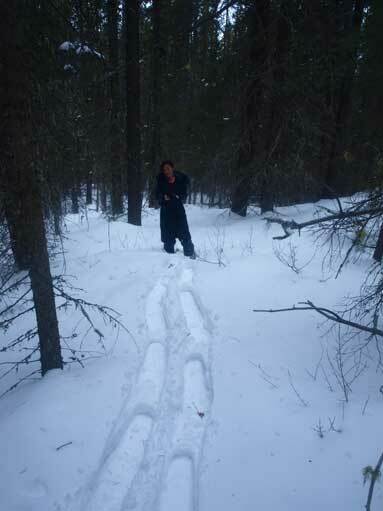 But we did manage to find a snowshoe trail after roughly 30 min trail-breaking, which saved a lot of energy. My mom couldn’t keep up with my pace, so I pretty much ascended in a leisure pace. After 1 hour 50 min, we broke the treeline. 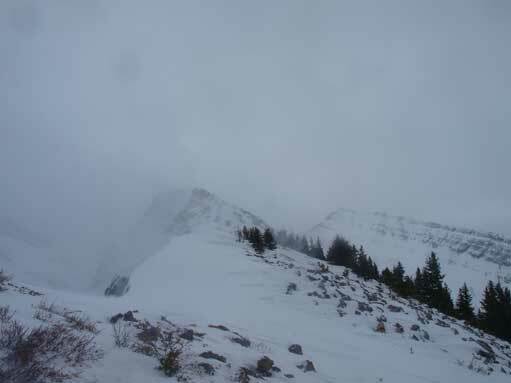 The wind speed suddenly increased from zero to almost the strongest speed I’ve ever experienced in the Rockies… My mom couldn’t even stand balanced in that wind, so she decided to wait for me at treeline again. Me at treeline. It was cold! 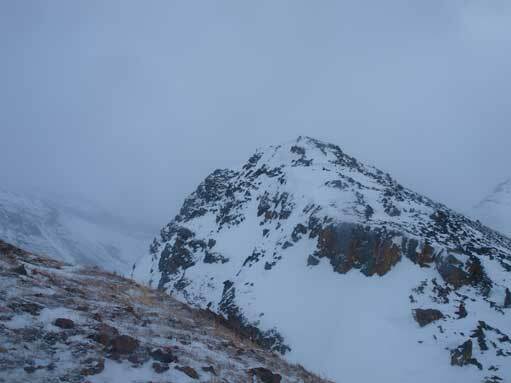 Despite the crazy wind that nearly knocked me off balance several times I kept charging up towards the summit. The sky was grey but at least it was not a whiteout. 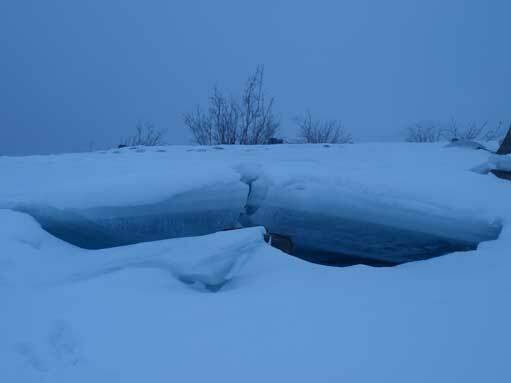 I had good visibility in negotiating the terrain but didn’t get much of views. The ridge itself, I would say, it’s an endless-false-summit ridge… Holy crap, after you climb over a hump, there are always more to come. It’s pretty discouraging, especially under this strong wind. 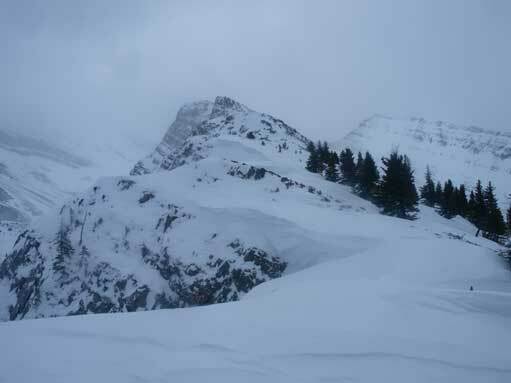 I had to ditch my snowshoes after the first hump, then it’s a mix of easy and moderate scrambling. I hate the snow covered boulder field completely, as you could start a all-the-sudden knee deep post-holing without even a clue. Without care, you would easily break a leg or ankle. It took me 1 hour 40 min from the treeline to the summit. I didn’t find a register, and the cairn wasn’t big at all, but I was sure it’s the summit. This down-climb was circumvented on right side. 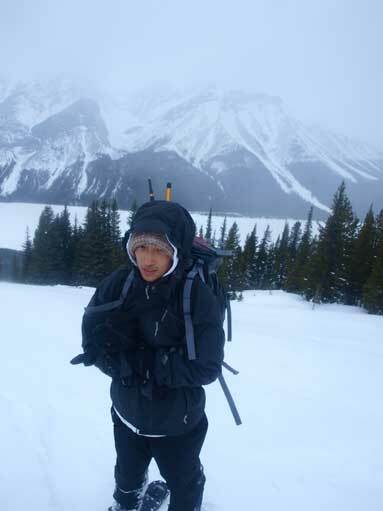 I didn’t linger any longer, but started descending ASAP….. TOOOO windy and cold. 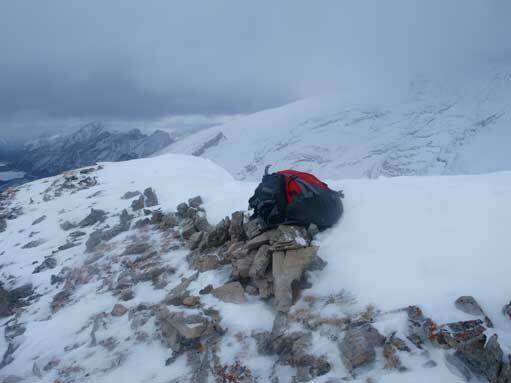 Due to the snow-ice-covered boulder field, I couldn’t descend much faster. It took me 1 hour 10 min to get back to treeline. 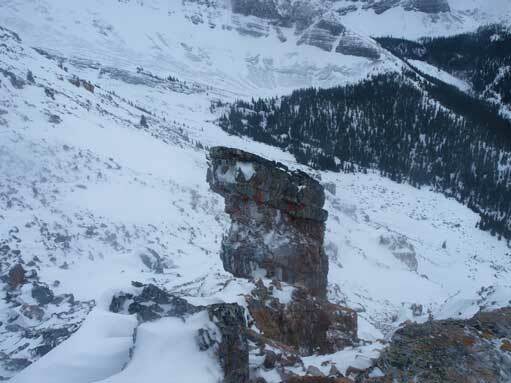 By the way, the cornices on Red Ridge were amazing, but could be death-traps. I almost stepped through one of them. 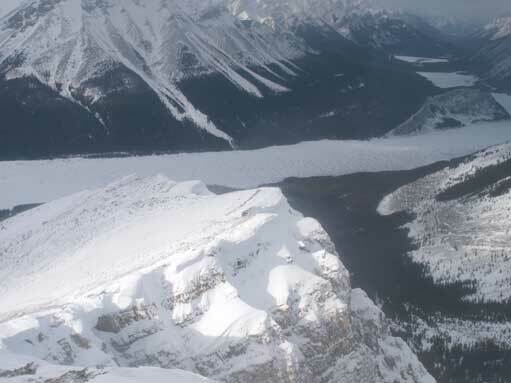 An impressive ice formation on Spray Lake. It started to snow at this point. It took no time nor energy to snowshoe back to our car. 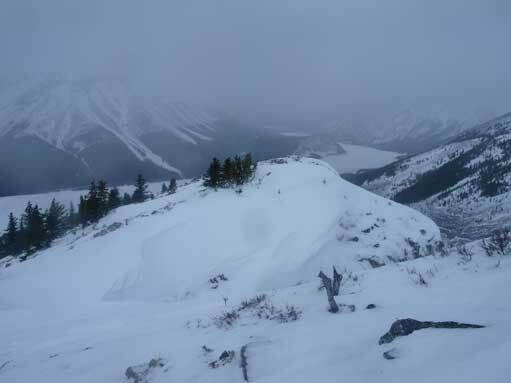 Since we still had daylight time, we decided to give Spray Lake a visit, that was, snowshoeing on to the lake to soak in the views… (Well, the views were obscured by the clouds though).. Anyway, another pretty successful weekend.